Egypt’s Coptic Christians will learn the name of their new pope on Sunday, when a blindfolded child selects the name of one of three candidates. Two bishops and a monk are on the shortlist to become the 118th leader of the largest Christian minority in the Middle East, about 8 million strong. The individual chosen will succeed Pope Shenouda III, who died in March. Attacks on Copts are on the increase, and many Copts say they are afraid of the governing Muslim Brotherhood party. Pope Shenouda III, who led the church for four decades, had urged officials to do more to address Copts’ concerns. The shortlisted candidates are Bishop Raphael, Bishop Tawadros and Father Raphael Ava Mina. They were chosen in a ballot by a council of some 2,400 Church and community officials in October. Their names will be written on pieces of paper and placed in a box on the altar of St. Mark’s Cathedral in Cairo. A blindfolded boy will then be asked to draw out one of the names. Copts say this process ensures the selection is in God’s hands. The chosen man will be enthroned in a ceremony on 18 November. 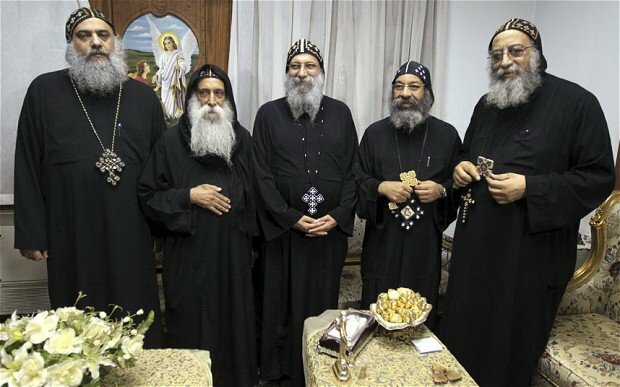 No-one in Egypt expects the new pope to introduce any radical changes to the deeply conservative church. Under Pope Shenouda, the Coptic Church expanded significantly, including outside its traditional Egyptian base.